EXTREME Rock and Roll BINGO "Music Jukebox Bingo"
Extreme Bingo software brings together 2 favorite games. For example: Name that tune (or name that video bingo games, or name that picture, etc) and Bingo which come together as an extremely fun round of Music Bingo. Before you go to your show our music bingo game will make your music bingo cards in the size, color, and quantity you desire. No need to bring your printer to the event! Your bingo cards can include your logo, watermarks, header text, footer text and more! Hint: Acknowledge your client name or establishment name on header of the cards. Hint: Put your company name, website and phone number at the bottom of the card. Your music bingo card becomes something like a business card! Face it, Bingo is one of the most popular games for any age group. The same is true for 'Name that Tune' games. Extreme Bingo brings together these 2 fun and popular games into an extremely fun time of Music Bingo (or video bingo games, picture bingo, trivia bingo, DJ bingo game, Rock and Roll bingo, Radio Bingo, Jukebox Bingo and more). 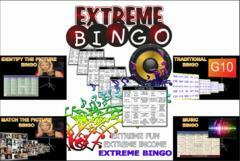 Extreme Bingo is complete with 16 VARIATIONS OF DJ BINGO PLAY, and growing! There are numerous variations of playing bingo games that are fresh, unique and most of all FUN! These bingo variations below are time-tested games that are excellent ways of getting more events booked while increasing your bottom line. You can do different bingo games the same night, or you can keep each night the same and then change it to a different variation the following week, then a different variation the week thereafter. There really is no wrong answer whether the variations are used in a night, or are themed for each night and then switched each week. Work with the ones you and your players like best. In time you might trim off a few variations that aren't as popular for your particular audience. Try the variations below and you will see the success that these music bingo games will bring you. Have you also discovered a unique variation? If so, be sure to let us know all about it! We just might add it to our growing collection of bingo game variations. Here are a few games to get you started. If you feel you need more ideas just let us know! This is only a SMALL SAMPLE of game ideas that we are aware of, but the variations below are definitely the most popular. Music Bingo Game (Standard) - Build "catalogs" of songs from your own library of tunes. These catalogs are like a 'play-list' except it is randomized, like balls in a bingo drum. Extreme Bingo will randomly play the songs and players try to identify the song title, like name-that-tune and dauber it on their bingo card until someone gets 5 in-a-row first (or whichever bingo pattern you specify). This is the most standard DJ Bingo variation used. 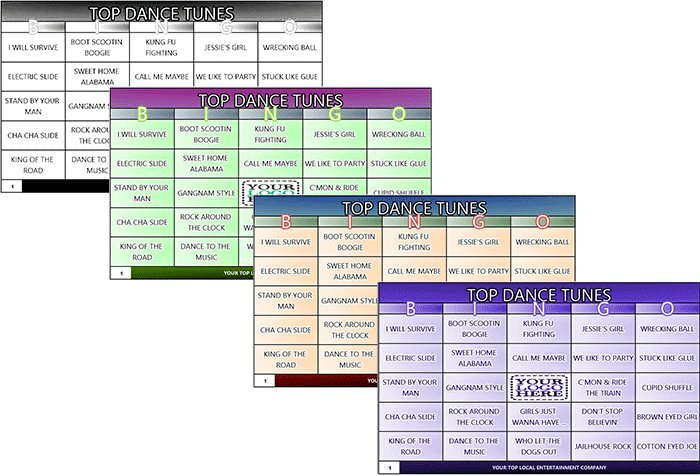 Your music bingo cards are automatically generated by Extreme Bingo and saved to PDF with the music titles in each bingo card. Music Bingo (Help 'em Out) - While the songs are playing you can show the song title on the big screen to take the guess work out of more obscure songs, or to make it fun when doing music bingo sessions with young people. Alternatively, you can scramble the text to add even a further exciting element to the game. This variation is perfect for any requested DJ Bingo game. Music "Radio Bingo" (Multi-Winner Game) - When you have a winner, continue for 2nd and 3rd prize winners. 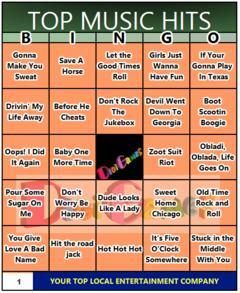 Use this variation for a "Radio Bingo" style game with top tunes most commonly played on the Radio. Video Bingo (Help 'em Out) - Use the same 3 variations above but with music videos, instead of just music. Video bingo games allow you to further diversify your bingo shows by having videos. 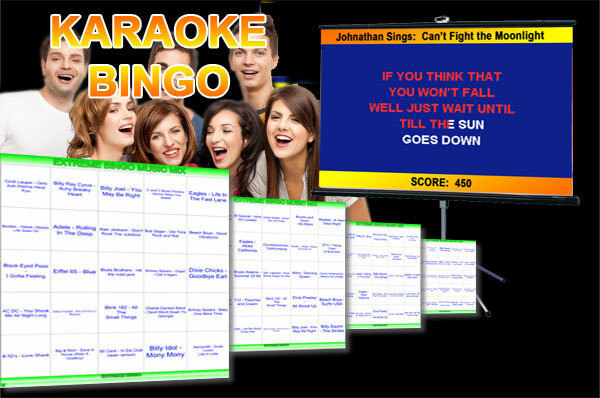 The videos play and players identify the song title and mark their bingo card. This is also one of the more popular DJ Bingo formats. Picture Bingo (Match the Picture - Easy) - Import your pictures into Extreme Bingo for "Name the Picture" sessions. This fun variation can include pictures of famous actors, actresses, guitarists, politicians, historical figures, cartoon characters, shapes of US states, things found in nature, and so much more. Extreme Bingo will print your imported pictures onto the bingo cards. Players match the picture on their card with what they see on the big screen, and dauber it. Picture Bingo (Identify the Picture - Difficult) - Similar to the variation above, but instead Extreme Bingo will put the picture title in the bingo squares, instead of the picture itself. This means that players have to know what "Slash" looks like so that when his picture is shown then the player can dauber the bingo square that says "Slash". Picture Bingo (Help 'em Out) - With this variation, show picture names on the big screen, or show them scrambled as an added element to variations 7 and 8 above. Sing-A-Long Bingo (Open Mic) - Place an open mic sing-a-longs where people run to a centrally located mic on a stand to sing to their favorite tunes. Karaoke Bingo (Open Mic with Words) - Extreme Bingo supports MP3+G files, CDG and also karaoke .zip files. Create a hilarious element to the festivities by selecting singers to sing each karaoke song played. Watch as they squirm attempting to sing songs they don't know. As a reward to the singers they can dauber any 2 squares on the card for the next round as an incentive to sing the tunes. Just like video Bingo games with some great visual appeal, karaoke Bingo also provides that 'something extra' to look at. Name the Artist Bingo - Instead of guessing the song title, players must dauber the name of the artist that wrote the song (or the lead singer) on their bingo cards. Name the Album Bingo - This is very difficult to play, but it is fun. The song or video plays and players must identify and dauber the album title on the bingo card. 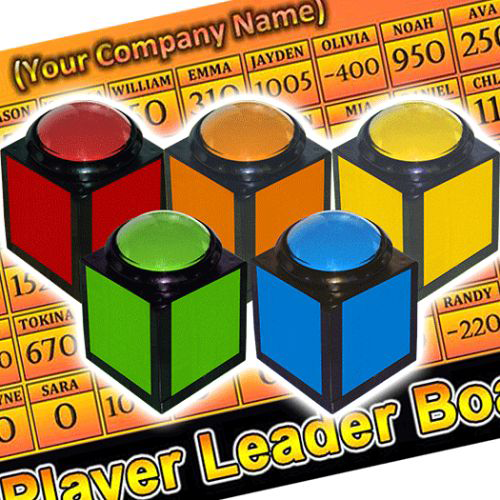 Trivia Bingo - Extreme Bingo allows you to put in your own trivia questions into the software. The trivia questions show on the big screen and players must find the answer on their bingo card and dauber it. Traditional Bingo - This is the least interesting, old-school method of doing bingo..... but hey, we support it! Why not? If you want an electronic version of a bingo drum filled with balls then you can do it also with Extreme Bingo. World of colors (all songs have a color in the title) See "List of songs with colors" in the title. Girls names / Guys Names (Play a variety of songs that use names like "Jessy's Girl") See "List of songs with Women's Names" and also "List of songs with Men's Names" in the title. Drinking Songs - See this great list of "Top 100 Drinking Songs". Alcholol Songs - Use songs with "Beer" "Tequila" "Wine", etc in the title. See "Songs with Alcholol in the title"
Sing-Along Songs - Use songs that people can't resist singing along to. Here is a great list of "150 Singalong Songs". "Burning Bingo" - Use songs with "Fire", "Heat", "Hot", "Burn(ing)". Check out this list of "Songs with Hot in the title". "Chillin' Bingo" - Use songs with "Ice" "Cold". See "Songs with Ice" and "Songs with Cold" in the title. "Get Up And Dance Bingo" - Play complete dance songs, like Macarina, Cha Cha Slide, Cupid Shuffle. The only people who can mark the song on their card are the ones who dance to a majority of the song. Make specialty rounds for younger audiences – our Kids Star and Kids Beat games cover all of today’s hits, and are perfect for any party! 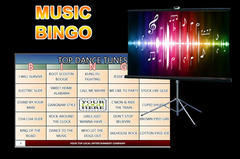 Whether you are doing music or video bingo games the above suggestions are a sure fire hit at any "DJ Bingo Game" event! 16 Variations of Playing Extreme Bingo - All in 1 program! Extreme Bingo "Music Bingo" is the latest in a long line of innovative products from a brand that places YOUR needs at the forefront of its mind. Constantly striving to achieve customer satisfaction and producing music bingo games that will entertain and satisfy any audience, DigiGames prides itself on being a market leader. Without doubt Extreme Music Bingo keeps that ambition in place. You can make each show fresh and unique with 1 program that easily handles a total of 16 variations of playing Extreme Music Bingo. As an entertainer you know the trouble with music rounds. Finding music, pitching it to your audience, researching hits...it is quite a time consuming part of the trivia preparation and at the end of the day all you may find yourself doing is hitting play a few times. Most Trivia nights across the globe have the same standard music round, 5-10 introductions and players have to guess the artist. Why not make YOUR music / video bingo games, picture, or trivia games, a little bit more unique by embracing any of the 16 variations available in Extreme Music Bingo? Why Buy or Rent Extreme Bingo? Extreme Bingo combines two favorite pastimes together into one, high energy and quite frankly ADDICTIVE live DJ Bingo show. Take the edge-of-your-seat element of Bingo and add to that a "name that video" or "name that picture" or “name that tune” and you are half way to understanding what this program is all about. DigiGames have brought together two elements people know, love and have been playing for years to produce a game that is fresh, exciting and creative. And above all else EVERYONE will be talking about it! The program works in a simple fashion whereby each player is presented with music bingo cards containing a list of songs, videos, artists, pictures, trivia answers or anything you import into the program. Extreme Bingo will then play whatever media you throw at it, and if players can match what they think they are hearing to a name on the card then it is marked off. Get a house or line and its BINGO! Have your players pondering “Is this ‘I Wanna Hold Your Hand’ or ‘She Loves You’?”, have them debating over artists and above all else give them a much more interactive music trivia experience than simply handing them a pen and paper and playing a few tracks. When doing video bingo games who can take their eyes off of a music video like "Summer Nights"! As an entertainer, the joy of the Extreme Bingo system is that it does the work for you. When one of your players claims to have a bingo you simply punch in the card ID and the system will tell you if we have a winner. A correct claim? Fireworks will shoot and a vivid display will mark the end of the round. A false bingo? The program goes on. Either way, you are ready to play again making Extreme Bingo a fun, fast and edge of the seat experience. You can even keep the session going on to award 2nd and 3rd place prizes….as many as you like!....but the beauty of this music bingo game is that the work is done for you. In fact, it is the ease of set up that will make it even more appealing to you as an entertainer. The random music bingo cards are generated and printed with just a few clicks of a button. Extreme Bingo sets up your music bingo game quickly. The built in music shuffle feature means you never have to pick and choose songs in a certain order and checking of claims. Hassle free Bingo hosting leaving you to concentrate on making a fun night. 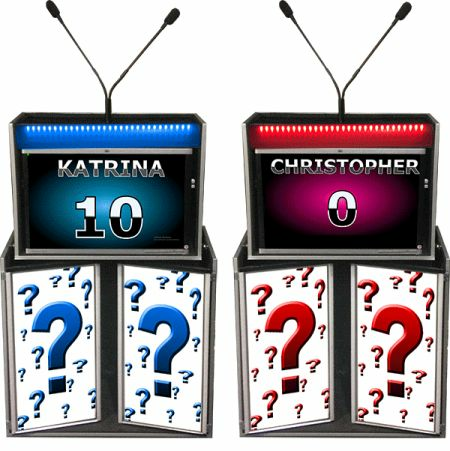 Extreme Bingo, like all of DigiGames products, is customizable with hosts able to determine music bingo card size, amount of winners, patterns needed for victory….it is all there for you to be able to make your music bingo game night the most unique and most creative it can be! Tell your potential clients you have a Rock and Roll Bingo game and watch the bookings roll in! It goes without saying that throughout your use of this product the efficient and reliable customer service team at DigiGames will provide you with quick, direct and professional support to tend to your every need and ensure your music bingo game night runs smoothly. We want you to succeed and will do everything we can to help you! One of the more popular game formats entertainers around the world use is a "Rock and Roll Bingo" format. Rock and Roll music has been one of the more popular genres for over 70 years now and continues to be loved by all ages. Why not create your own Rock and Roll Bingo night with music ranging from all eras? Your first round can be Rock and Roll from the 50's and 60's, like Chuck Berry, Beatles, and Beach Boys. Then your next round can be Rock and Roll from the 70's and 80's, like Joan Jett, Kiss, AC/DC, Bob Dylan, and Dire Straits. The next round can be a Rock and Roll bingo game from the 90's to current, like Green Day, Goo Goo Dolls, Janet Jackson, Pearl Jam, Cold Play and more. If you need help selecting songs, Rolling Stone has a great top 500 Rock and Roll Songs of All Time page that will give you just the inspiration you need for making your own Rock and Roll Bingo games. 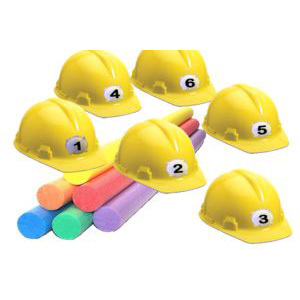 A great way to hold the attention of your audience is to add "Radio Bingo" games to your bingo night. 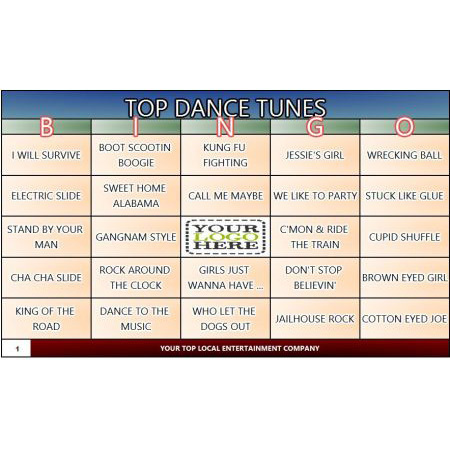 Take note of the Billboard top songs of the year across multiple genres to create an amazing Radio Bingo game. This method is perfect for creating bingo games that use songs that everyone playing will likely know. In this format, the objective isn't to stump the audience, but instead to play songs that people know and love. You will find it amazing how even grandmas and grandpas are familiar with new songs and artists popular on the radio. Since Extreme Bingo has a built in customizable crossfader you can crossfade music, just like on the radio. The ever-growing popular format "Jukebox Bingo" provides a unique magic to your events above all other music bingo game formats. Similar to "Radio Bingo", which consists of songs virtually everyone will know, Jukebox Bingo is desired because it involves carefully selecting songs that people dance to. Face it, not every song played on the radio is dance-worthy. Just because the song is popular doesn't mean it is easy to dance to. Think of it this way: When people put their money into a Jukebox what is the purpose? Just to sit and eat and hear the song? Not likely. A radio will do that for free. However, people will pay money into a Jukebox because it is a song they want to dance to at that moment. So, in this format, take a little time to select upbeat songs that are easy to dance to. In other words, pick songs that someone would feed money into a Jukebox to not just hear, but ultimately to dance to. This can include not only upbeat songs with a fast or heavy beat, but also slow-dance songs. If you want EXTREME fun, EXTREME innovation and EXTREME profitability, then add EXTREME Bingo to your Trivia night and make your event the best in town! 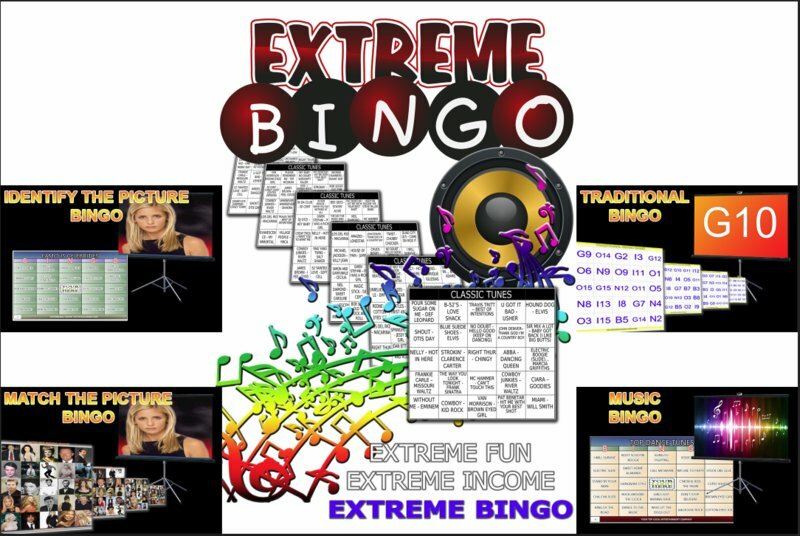 To PURCHASE Extreme Bingo simply "Add To Cart" at the top-right of this page. Works with your Media for Music Bingo, Video Bingo, Picture Bingo - Music, video pictures, trivia and more to create and save an unlimited number of Bingo sessions. 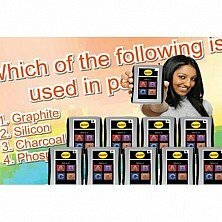 Play Trivia Bingo - Extreme Bingo allows you to add trivia questions and answers. Answers appear randomly across the players cards and trivia question appear on the video screen. Players solve the answer and hope to find the answer on their card. Players play to solve 5 trivia answers in a row (or any other pattern you specify) to win. Standard Bingo - If you have to transport a huge Bingo drum and bingo balls to an event, leave it at home! Extreme Bingo provides an electronic method of the SAME thing. Generates Bingo cards - Each music bingo card is made for you in the size, quantity, and color scheme you desire. Print as many cards as you need. Leave Your Printer at Home - Print your Extreme Bingo cards in advance and bring them with you to your show. Laminate the cards and save on printing costs. Completely Random - Each Extreme Bingo session you play will be fresh and unique, even with the same song catalogs you create. Automatic Card Checking - When a player has a Bingo, enter the card ID into Extreme Bingo, and Extreme Bingo will confirm it for you automatically. Fast Shows or Dance Shows - Control the Pace - When doing Music Bingo or Video Bingo you can play an entire song/video, or a portion of a song/video. You decide how long each song/video plays and how much pause time between them. A speed control allows you to make popular tunes more difficult to solve. Dual Monitor Capable - Connects to a projector and makes great use of your computer's video out. Pictures, video, trivia questions, your logo.....whatever you want will show on the projector screen. 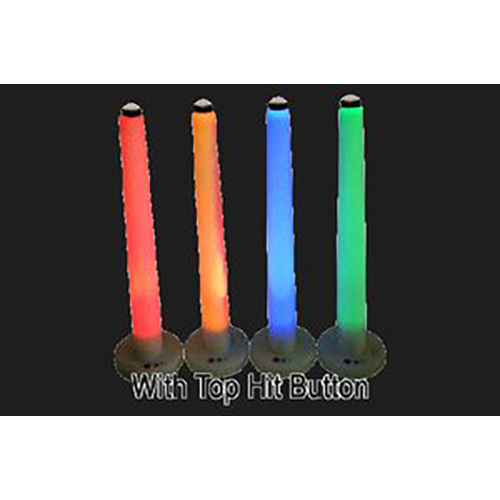 Perfect for Fundraisers - Host at any school or other fund raising events. Charge $5 to $10 per music bingo card for people to play. Completely Customizable - Easily add into the software your own company name, logo, website info and more. Customizable Bingo Cards - Put your own messages within the music Bingo cards top and bottom banners (headers and footers). This is a great way to brand Bingo cards with your company name, website, and phone number or even sell advertising messages. No Deafening Silence - People who like traditional Bingo LOVE Extreme Bingo. Extreme Bingo takes all the silence out of a very fun and popular bingo game. Get Creative - You can specify "5 in a row win" or you can specify many other pattern variations like Kite, Picture Frame, X, L, T, Around the World, Blackout, or any other pattern you wish! Extreme Bingo even lets you customize your own winning patterns! Single-winner and multi-winner capable - Extreme Bingo also allows you to stop after a player has a bingo or continue for multiple winners per round. Music Bingo is the most popular format, however Extreme Bingo allows for 16 variations of playing - and growing! Custom Card Sizes - Print 1, 2, or 4 cards per page Specify 1x1, 2x2.......5x5 cards (traditional) or any variation in between like 3x5. Supports Karaoke - Extreme Bingo supports mp3+g files so that you can have singers singing the songs instead of playing the real version. Since players will be singing the songs at their tables anyways, why not put a microphone in the audience for crowd interaction? This takes Music Bingo to a new level with audience participation. Playlists Supported - If you have another software program and you have created .m3u playlists, the playlist file can be imported into Extreme Bingo with a single click. Support - A great product is important. The support you may need is just as important, if not MORE important. Ask us a question, get stuck, whatever....we are here to help you. Also, updates are free for life which means that the many cool things that we will be adding to Extreme Bingo you don't have to pay a penny for! Additionally, if you have an idea or suggestions we love to hear them. You might just see it implemented into Extreme Bingo! Extreme Bingo was a big hit last night at a post prom party!!! Talk about an easy night 4 hours I charged $1,295.00 and they gave us a $150.00 tip!! The kids loved it and the parents really LOVED it!! They are loving music bingo here on the South Coast NSW, Australia, and I'm one of the first to offer it, thanks to your program. It's broadened and diversified my entertainment business. It gives me the opportunity to offer different fundraising & entertainment options, on top of my Emcee services & trivia shows. I love it, my hosts love it too, as it is so interactive and fun. Dianne Croucher - "Infinite Entertainment"
I just recently purchased the Extreme bingo software from digigames. I used it today 2/9/2014 at a Birthday party. What a huge success my radio bingo game was. I have also bought and used the clobber game show as well as the wheel of fortune game pack. I will continue to purchase items from digi-games in the future. Thank you Thomas for helping me with some questions I had. This program will definitely take my business to a different level. Brian Rutherford - "A+B Music"
I had to buy Extreme Bingo when I saw music bingo debuted at Mobile Beat in Vegas this Winter. In the two months that followed it's release, were some of the most amazing upgrades I have seen. The staff at Digigames has taken input from all of customers, then added and tweaked so many features. Whether you want to play regular bingo (and not bring in a cage and balls), trivia bingo or my favorite, music video bingo and Rock and Roll bingo; this program does it. The ease of use is great, anyone can make and run a show. I have had so many people come up and tell me how much fun they had playing this. The potential is endless. Thanks for another great software tool and for implementing my suggestions in the updates!!! Alan Ley - "Sound Master Entertainment"
I did Extreme Bingo at a Golf Course over 55 community. They were so receptive to it and were singing loudly and dancing. At one point when doing music bingo Hot Hot Hot played and half the audience got up and formed a Conga Line around the room. I had to pause it so they wouldn't miss the next song. I purchased Extreme bingo after seeing it for the first time at Mobile Beat in Las Vegas. It has been such a pleasurable experience working with the wonderful support crew at Digi Games. If I incurred any problems they were on it right away. This last update has included so may features which give you the options of so many variations. This is a wonderful addition to our mid week Trivia. I highly recommend the purchase of Extreme Bingo and any of the other Digi Game products. Thomas DiFlorio - "TCB Mobile Entertainment"
Andy Powell - "Select Entertainment"
Unbelievable! Last week I did Extreme Bingo as an ‘Ice Breaker’ for a dinner/dance. I was planning on only doing 1 regular round. After someone yell “EXTREME BINGO”, they insisted I do another, so we did “Extreme “X” on the card. Then again, after someone yell “EXTREME BINGO”, the crowed yelled for “Fill The Card”. I mean, they YELLED! I was amazed and blown away by they way the reacted to Extreme Bingo! Keith Alan - "Keith Alan Productions"
I just wanted to tell you the video bingo was a great success. Everyone loved it. People were not just playing the game but singing along and dancing with the videos. Pete Armendariz - "Petes Mobile DJ Services"
What I got far exceeded expectations.....constant free updates, monster innovations, supreme customer support and, most importantly, a really unique way to pocket some serious coin. What a truly great concept! As you know, I'm in a retirement community and the interest is definitely there. When I mention it, people's eyes seem to light up. What else could I ask for? Ric Mitchell - "Ric Mitchell Entertainment"
Digi Games has been a fabulous place over the years for me to get some new and fun games for my guests at our shows. We love the great ideas and products!! They are kind and offer great prices!! Karie Lynn - "Dynamite Reflections Entertainment"
First bingo show: check. They're are having me back next week and it was only supposed to be once a month. So they liked the concept of music bingo! I especially like all the Bingo variations available in the program. Very versatile! Robb Ellicson - "Spinn Doctors"
Rob, I wanted to send you a quick email to let you know I Love Extreme Bingo. It is the best product that DigiGames has ever created. Our company has used it many events and made lots of money using it. This program also makes some amazing music bingo cards. Clients have told us it is a very unique option and they love using it at their events. We have always purchased game show controllers and software from you and would highly recommend DigiGames and Extreme Bingo to everyone. Slade Smith - "AMS Entertainment"
I just want to share how much your Extreme Bingo program has become such an instrumental tool for me. We are a small restaurant/bar in Ohio. We found your program and fell in love with it. It has been easy to use since day one. We started using Extreme Bingo back in June 2016 with about 20 people our first night. Less than a year later we are averaging between 50 to 75 people per night. I have seen so many people of all ages having a blast and returning each week just to play . It's such an addictive game. When I start my night I visit every table and hand out bingo cards inviting them to play. When couples tell me that they just came to eat and run I say, "Well, that is great, I am just going to leave these here for you. If you decide not to use them the waitress will pick them up and return it to me when you leave." Most times those couples end up playing and stay the whole time that we do our show. It shows how addictive it can be. Actually. I had a couple say they could not stay because they had to go home and let their dogs out. I left cards on the table. They ended up playing anyways. They left to let their dogs out and were back for the next 4 games of the night. They have been back every week since. Your program has helped me to at least triple the establishments profits for that night and double, at least what the servers make on that night as well. I also want to say that your support has been phenomenal. And have been able to answer every question I have had. Thank you Tom and Digigames for helping me turn a regular night out into an extraordinary night out. All Bingo variations are compatible with Windows Vista, Windows 7, Windows 8 and Windows 10. Compatible with Mac running Mavericks 10.9 or newer. i4 processor (CPU) minimum required. Price includes licensing for 2 computer systems. Extreme Bingo participants listen to the song and try to solve the artist, song title, or both and check their card if one of their Bingo squares contains the song. If it does, then the participant should use an ink pen to X the square. If the song isn't on their bingo card then the bingo participant waits for the next song to play in hopes that it is a song on their bingo card. This process continues with song files playing until a participant claims to have a bingo (5 in a row or any pattern you specify). In this case, the Bingo player rushes up to the DJ area and submits the bingo card to you for confirmation. Simply type in the "Card ID" which prints at the bottom of each Extreme Bingo card, and Extreme Bingo will check it for you! If it is proven to be a true bingo, then fireworks appear and music plays as a grand finale. To play another session simply select the same or new playlist catalog. Select the option 'Show File Information on secondary screen. In this variation, players don't have to solve the song title as it will display on the projector screen. Players view the song title on the screen, and reference the song title on their cards. This is a good variation for use with children as only the ability to read is required, not solving the song. TIP: You can not only show the song title but you can select to scramble the letters of the song title. It may help stuck players but may confuse people who may have been able to solve the song title otherwise. Either way it adds a great element of help and confusion creating a nice twist on the game. Instead of immediately loading in a new catalog after a winner is confirmed, you can continue the current round to determine a second and third place winner. To do so, simply press stop to stop the fireworks animation file with music and then press 'Play' again to resume the current session. First read variation 1 above. Instead of loading in audio files, load in video files. The videos will play for a specified period of time. This variation provides enhanced 'eye candy' as there is an extra element of visual components for the players. VARIATIONS 5 and 6: Use Variations 2 and 3 above with EXTREME VIDEO BINGO. While the primary application of Extreme Bingo is for identifying audio and video files, you can also use pictures. Extreme Bingo is designed to be projectable which means that pictures you put in your custom catalog will display on the video screen for a specified period of time. Bingo players view the picture on the video screen or TV and are required to identify something about it. Many variations could be included here, but perhaps you have pictures of famous musicians, politicians, notable landmarks, common company logos, and cartoon characters.....anything you can think of. Players view the picture on the video screen and find the text on their Extreme Bingo card that corresponds to the picture. For example, a picture of Mickey Mouse means that players must find the text “Mickey Mouse” on their Extreme Bingo card. The first player to solve 5 in a row wins! VARIATIONS 8 and 9: Use Variations 2 and 3 above with EXTREME PICTURE BINGO. When printing Extreme Bingo cards, you can specify to print the actual pictures within the Extreme Bingo squares, instead of the file name (as discussed in variation 7). Pictures appear on the video screen and players must find the picture on their Extreme Bingo cards. The pictures typically would all be distinct and different from each other, but to increase the difficulty level you can create strikingly similar features between pictures making being observant critical. However, make sure the ink pen doesn't make it difficult for you to confirm a claimed Bingo. Use an ink pen, not Bingo Dauber, unless you laminate your Extreme Bingo cards. Create a catalog of only 25 audio, video, or picture files. To do so, first release the 75 files requirement in the Control Panel within Extreme Bingo and change it to 25. Print your Bingo cards as usual. In this variation, Bingo players identify the song, video, or picture and before the player can cross off the square must race across the room to a DigiGames wireless buzzer and press it. NOTE: In this variation (Variation 11) the more players you have the longer the game will take to play out before there is an actual Bingo. You may want to restrict the number of players to no more than 5. Using more than 5 players may require reloading the same catalog back in again and the game can prove to be exceptionally long. Extreme Bingo also supports mp3+G files (mp3 plus cdg). In this variation, instead of playing the real songs, people come to an open mic and sing the songs while Bingo players solve the song title. This adds a new element to a fun music bingo game. To use this feature, import your audio into Extreme Bingo like you normally would. If there is a matching cdg file in the same folder as the mp3 Extreme Bingo will see it and use it accordingly. The karaoke text will appear in the small window on your screen but will also nearly fill the video screen as well. NOTE: Typically you would use only a karaoke monitor for the karaoke singers, and not put the karaoke text on the video screen. This is because karaoke tracks typically reveal the song title and artist at the beginning. Also note that in this version the mp3+G file ALWAYS starts at the beginning of the track regardless of how you have Extreme Bingo setup. All the variations above are "Name that Tune" format where players must correctly identify the song. However, if your music or video files are in the format of "Artist - Title", you can specify to print artist only (prints any text before the hyphen) or Title only (prints text after the hyphen). This makes doing music bingo fresh and unique, especially for multiple rounds in a single evening. Additionally, if your files are in the format of Album - Artist - Title then you can create cards with just Artist and Title, or any combination you want. Extreme Bingo allow you to type in Questions and Answers. Bingo cards print the answers only. 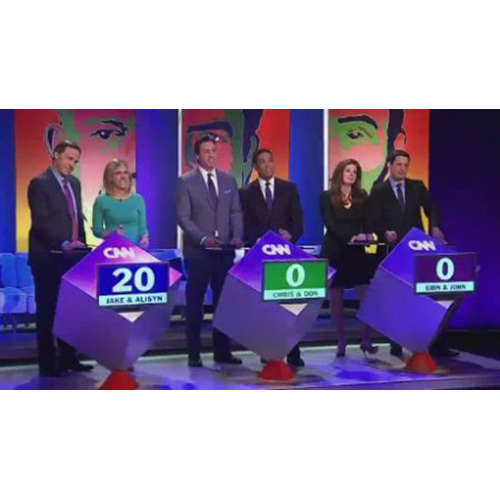 Questions appear on the screen and players have to identify the answer and find the answer to the question on their Extreme Bingo cards. Solve 5 questions whose answers appear 5 in a row on the card and the player has a Bingo! Extreme Bingo allows you to type in standard text like "B5" and "N3". The text you customize and save your own text. The text is printed randomly across the players' Extreme Bingo cards. This allows you to play a traditional Bingo game just like traditional Bingo games but without having to bring in a huge Bingo drum filled with actual Bingo balls. This is a further variation based on Variation 10. A catalog is part of this program called 'Sample Picture Game (For Kids)'. Use this variation at weddings or any other events were there are young people under the age of 6. 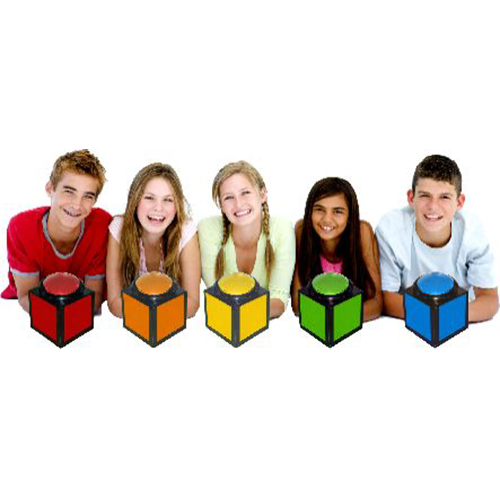 This sample game challenges youths to find colored shapes, letters and numbers on their Extreme Bingo cards and to mark them. Involving as many youths as possible in their own special dedicated Bingo game will often make you the star of the show from friends and family of the youths. i4 processor (CPU) miminum required. What does your purchase of Extreme Bingo include? Software licensing for 2 computers. You supply the music, videos, pictures, trivia (or whatever you want to import into the program) and the program will automatically make bingo games out of the content you import. Extreme Bingo will make the random bingo cards in the size, quantity, and color(s) you desire.